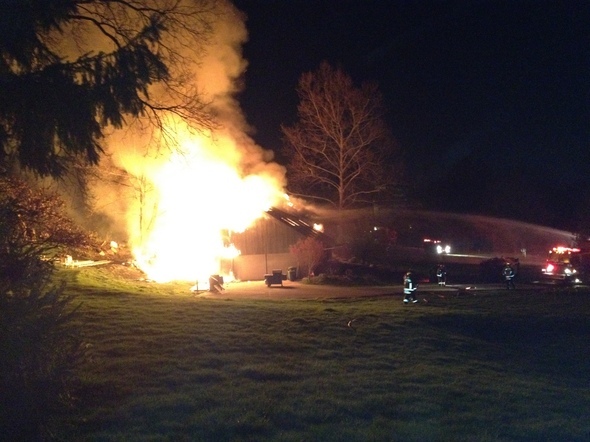 Posted on Sat, Apr 7, 2012 : 8:19 p.m.
Ann Arbor firefighters were on the scene for nearly seven hours as an inferno destroyed a home on Hunting Valley Road. Misfortune struck an Ann Arbor home for a second time when it was destroyed in a fire late Friday night that occurred just after its owners had completed repairing the damage caused by a lightning strike last year. 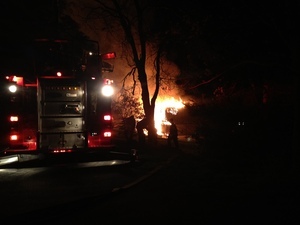 Ann Arbor Fire Battalion Chief Randy Menard said the fire at 3125 Hunting Valley Road was reported at 11:11 p.m. on Friday, and firefighters didn't clear the scene until about 5:40 a.m. on Saturday. No one was injured, and the cause of the fire hasn't been determined, he said. Menard said the home had just been issued an occupancy permit, but the owners hadn't moved back in yet. He said the house was struck by lightning last year, and the owners were living elsewhere while they had the damage repaired and the home renovated. It took firefighters about an hour to bring the blaze under control but they stayed on the scene until early Saturday morning because an excavator had to be brought in to remove portions of the home that had collapsed into the basement, Menard said. He said the Pittsfield Township Fire Department assisted by bringing its 100-foot tower truck to the scene. Menard said the home was a total loss. The damage was estimated at $500,000 for the home, and $150,000 for its contents. Nicholas Ferrario had driven from Chicago to Ann Arbor to visit his parents on Friday night, and arrived in the neighborhood just as the fire broke out. An investigation into the cause of the fire is continuing. This video was provided to AnnArbor.com courtesy of Nicholas Ferrario. Tue, Apr 10, 2012 : 1:02 a.m. It is irresponsible reporting of AnnArbor.com to publish the owner's address. Mon, Apr 9, 2012 : 6:49 p.m. I live in the neighborhood. The 911 call went in 11:11. When I arrived at the fire at 11:30, fire trucks were already there actively battling the fire. If there are only 5 fire trucks in Ann arbor, why were there 6 Ann Arbor fire trucks at the scene? The Pittsfield township truck that was called in performed a great service, allowing firefighters to get at the fire from a very different angle when it was still out of control. As an observer at the fire, I saw these firefighters work very hard for hours and they did a great job. My heart goes out to the wonderful people whose house burned to the ground. Reading some of these posts makes me wonder if people have any caring and empathy anymore. Sad commentary on our society. Mon, Apr 9, 2012 : 9:12 p.m.
&quot;The 911 call went in 11:11.&quot; I am curious how you know that? I would imagine more than one 911 call was made. Mon, Apr 9, 2012 : 8:22 p.m. Welcome to Ann Arbor, home of the sycophants. Mon, Apr 9, 2012 : 12:39 p.m. It is a tragedy that this home burned but thankfully no one was lviing there and no one was injured. Those who blame the Fire Department are simply wrong. The fire department provides a service with the resources provided by the city council and mayor. Unfortunately public safey does not seem to be as high a priority in Ann Arbor as public art. Don't blame the fire department for their lack of resources, blame the elected officals with misguided priorities. Mon, Apr 9, 2012 : 12:25 p.m.
A number of inappropriate comments posted over the weekend have been removed. Mon, Apr 9, 2012 : 2:38 p.m.
Not all of the commentors whose comments were deleted were &quot;speculating&quot;. And the real question is, were all the comments that were deleted in violation of your &quot;guidelines&quot;? Nope. I guess today we're going with subjective inappropriateness. Mon, Apr 9, 2012 : 2:05 p.m.
you would guess wrong. If my completely remodeled (based not on the story but permits pulled) that I hadn't even moved back in to burned I would be leading the &quot;speculation&quot; parade. Mon, Apr 9, 2012 : 1:51 p.m.
Craig, the conversation went downhill from there. If it were your home that burned, would you want people speculating about it? I would guess not. Mon, Apr 9, 2012 : 1:38 p.m.
Steve, I was one of the first &quot;speculators&quot; . At no point did I or anyone speculate on the actual cause. The only thing that occurred was a hypothetical discussion of an unoccupied house, newly remodeled, catching on fire. I contend there is a difference between your version and mine. In any case I hope Ann Arbor.com will do a follow up. But in my daily experience at Ann Arbor.com follow ups seem to be hit or miss. Mon, Apr 9, 2012 : 1:28 p.m.
Mon, Apr 9, 2012 : 12:36 p.m.
Craig, Commenters were speculating on the cause of the fire when it hasn't yet been determined. Mon, Apr 9, 2012 : 12:32 p.m.
Sun, Apr 8, 2012 : 9:18 p.m.
Folks who are commenting are seriously missing the point of this article, or perhaps it is because not all the facts were reported. This was not the fault of the owners. It is totally unclear how this fire started, but it is clear that the the fire department's response was very slow. My parents live just up the street from where this fire occurred. Their neighbor called 911. Apparently it took 30 minutes for the Ann Arbor fire department to respond, which was not reported in the article. What in the world is happening in the town of Ann Arbor if the fire department can be so cut back that they cannot respond to fires in a timely manner? Is the City council out of it's mind to cut these services? I understand that there are now only 5 fire engines in the entire city of Ann Arbor. Outrageous!! It takes maybe 15 minutes tops to go from one end of Ann Arbor to the other obeying all the stop lights, etc. Why can't a fire engine, most likely coming from the center of town (I assume the main fire station has not been closed) to Ann Arbor Hills, which takes less than 10 minutes for a regular car, make it in under 7 without stopping at stop lights? It is outrageous that this house had to burn to the ground. People in A2 pay huge amounts of property taxes and they should be able to expect appropriate public service in return. This should not happen in any neighborhood. I hope there will be a huge public outcry. I also hope the University of Michigan, the town's largest employer, will take note. Apparently although they have their own police force, the UM does not have their own fire service, so if it takes this long to respond to a house fire, imagine the consequences if one of the large university buildings were to catch fire. I shudder to think! Sun, Apr 8, 2012 : 6:08 p.m.
From Wikipedia: Some structures are inherently more or less at risk of being struck by lightning. The risk for a structure is a function of the size (area) of a structure, the height, and the number of lightning strikes per year per mi² for the region. For example, a small building will be less likely to be struck than a large one, and a building in an area with a high density of lightning strikes will be more likely to be struck than one in an area with a low density of lightning strikes. The National Fire Protection Agency provides a risk assessment worksheet in their lightning protection standard. In this era when residential real estate is constantly in the news, I wonder why we don't hear mention of this recognized standard for risk assessment? Sun, Apr 8, 2012 : 6:10 p.m.
Bottom line: unless you're living on a plateau in Kansas, the chance of lightning striking your house at all, let alone igniting it are so incredibly small so as to be not worth worrying about. Sun, Apr 8, 2012 : 6 p.m. When I was a kid, we lived in a heavily wooded area. I couldn't have been more than six years old when I noticed a heavy wire (cable) attached to a metal stake in the ground by the chimney on the north side of our house. I visually followed the wire up the chimney and noticed it ended with a 1/2 inch thick metal rod which extended about 3 feet above the chimney. I asked my dad what this was for and he said, &quot;It's a lightning rod.&quot; He then explained about lightning being electricity and how the rod and cable guided the lightning to the ground. At that moment: I learned all of the basic facts about electricity - and about how having a house surrounded by trees might mean a &quot;visit&quot; by Mr. Lightning at any time. The cost of a lightning rod is tiny, considering the value of the property it protects. Houses are constructed of wood and, unlike commercial buildings, have no internal metal structure to channel lightning strikes to ground. So naturally, I wonder why we don't see lightning rods sticking up above every roofline. BTW: some might not know that the lightning rod was invented by Ben Franklin in 1749. Sun, Apr 8, 2012 : 3:07 p.m.
What a shame. Prayers to the family. Sun, Apr 8, 2012 : 2:30 p.m. Heaven forbid something tragic happens to any of you. These people just lost their home and not a single comment of support or empathy. This is really low. I am sorry for the loss of this family's home, after they've already been through so much. I hope something similar never happens to my family. I know I would be devastated. Sun, Apr 8, 2012 : 4:45 p.m. I agree completely Jordan I was reading the comments thinking the same thing. But I am thankful they hadn't actually moved back in and some of their belongings were out of the home. Sun, Apr 8, 2012 : 3:01 a.m.
That third paragraph needs some serious editing...in two places yet. Jeebus. Sun, Apr 8, 2012 : 12:51 p.m. Thanks. The paragraph has been corrected. Sun, Apr 8, 2012 : 10:32 a.m.
Ypsicat, send them your resume! Sun, Apr 8, 2012 : 2:18 a.m. So Pittsfield taxpers provided a 100ft tower truck. The $275,000 fountain was busy? Mon, Apr 9, 2012 : 5:12 p.m.
Craig - if and when Pittsfiled needs us we will happily return the favor. But Ann Arbor is a much larger and older jurisdiction with a very large college age population. We need them far more then they need us. And they have a tower. So unless it's strictly manpower they need, they don't have a reason to call us. Sun, Apr 8, 2012 : 4:52 p.m.
Everyone needs to work together to make sure the community is safe. There is a reason for that ladder truck and I am sure glad it was put to good use. Sun, Apr 8, 2012 : 12:56 p.m.
CityFF, does the Ann Arbor fire department ever return the favor and go to Pittsfield? I've been told you do by one of your fellow fire fighters in this website. If Pittsfield helps Ann Arbor considerably more than the other way around then you have a point. Sun, Apr 8, 2012 : 11:32 a.m. The fountain was actually $875,000. And yea Pittsfields tower and their staff were busy in AA all night cause AA doesn't want to pay for it themselves. This is not regionalization it's Pittsfield subsidizing the Ann Arbor City Fire department. Sun, Apr 8, 2012 : 2:52 a.m.
Sun, Apr 8, 2012 : 12:50 a.m.
Sun, Apr 8, 2012 : 2:19 a.m. According to the attribution he provided the video that was included below the article. Might have been a good idea for the story to reference that fact.